The 6-foot-10 center averaged 6.0 points and 5.4 rebounds last season. A person familiar with the discussion says LeBron James was in contact with the Cleveland Cavaliers when NBA free agency opened. Shortly after the 12:01 EDT a.m. start on Sunday, Cavs general manager Koby Altman spoke on the phone to both James and his agent Rich Paul, said the person who spoke to The Associated Press on condition of anonymity because of the sensitive nature of the discussion. James is an unrestricted free agent and the Cavs are hoping to re-sign the three-time champion, who is weighing whether to change teams for the third time in eight years. James was in Los Angeles and is also being pursued by the Lakers, who have enough salary-cap space to sign him and another star player. There was a flurry of big-name signings in the first hours of free agency, but James remained noncommittal. The 33-year-old is not expected to drag out a decision that could reshape the league’s landscape. – Tom Withers in Cleveland. Trevor Ariza is moving to Arizona. The Phoenix Suns have lured Ariza in with a $15 million, one-year contract offer, according to a person with knowledge of the negotiations. The person spoke on condition of anonymity because the deal cannot yet be signed. Ariza averaged 11.7 points last season for Houston, and the 33-year-old will likely be looked upon as a veteran presence in a young Phoenix locker room. Ariza was 0 for 12 from the field in Houston’s Game 7 loss to Golden State in the Western Conference finals, missing all nine of his 3-point tries. The Houston native has agreed to a one-year deal at the $2.4 million minimum, a person familiar with the terms tells The Associated Press. The person spoke on condition of anonymity because the deal cannot be signed until the NBA’s moratorium ends on Friday. Green averaged 12.1 points last season for the Rockets, who finished with the NBA’s best regular-season record. He had five games of 20-plus points off the bench last season. Derrick Rose and the Minnesota Timberwolves will be counting on one another next season. The 2011 NBA MVP has agreed to a one-year deal worth nearly $2.4 million to stay with Minnesota, a person with knowledge of the negotiations said early Sunday. The person spoke to The Associated Press on condition of anonymity because nothing can be signed until Friday. Rose appeared in 25 games last season – 16 with Cleveland, then nine off the bench with Minnesota. Rose averaged 5.8 points in those games with the Timberwolves, who went to the first round of the Western Conference playoffs and lost to Houston. It was Minnesota’s first playoff berth since 2004. Thunder forward Jerami Grant has agreed to a three-year, $27 million deal with a player option the third year. Grant’s agent, Happy Walters, confirmed Grant’s decision in a text message to The Associated Press. Grant averaged 8.4 points per game last season and shot a career-high 53.5 percent from the field. He became more of a factor after the All-Star break playing behind Carmelo Anthony. Grant again will join the Thunder’s Big Three of Anthony, Paul George and Russell Westbrook. A person familiar with the terms says Gay has agreed to a one-year, $10 million deal to be back in silver and black next season. The person spoke on condition of anonymity because the deal cannot be finalized until later in the week. Gay opted out of the final year of his deal with San Antonio, and wound up re-signing for a raise of about $1.6 million over what he would have made. Gay was primarily a reserve for the first time last season, his first with the Spurs. He averaged 11.5 points on 47 percent shooting. The people spoke to the AP on condition of anonymity because deals can’t be signed until Friday. Jordan opted out of the final year of the contract he signed when he jilted the Mavericks in 2015. If Jordan follows through on this agreement, he will leave the team that drafted him 10 years ago. He gives the Mavericks a rebounding and shot-blocking presence they’ve lacked since winning their only title in 2011. Dallas hasn’t won a playoff series since then. Chris Paul says he’s staying with the Houston Rockets. The star point guard wasted no time once the free agency window opened, and has decided to stay put with the team that finished last season with the NBA’s best regular-season record. Paul announced on Twitter that he has ”Unfinished Business” in Houston, which took Golden State to seven games in the Western Conference finals. Paul missed the last two games of that series with an injury, and the Rockets wasted big leads in both of those games. A person familiar with the situation says Paul George is staying with the Oklahoma City Thunder. The person spoke to The Associated Press on condition of anonymity because the deal’s terms have not been announced. George averaged 21.9 points for the Thunder last season. The move, which can become official on Friday, further validates Oklahoma City’s decision to send a package -including Most Improved Player Victor Oladipo– to Indiana last year for George, who clearly enjoyed playing with Russell Westbrook with the Thunder. 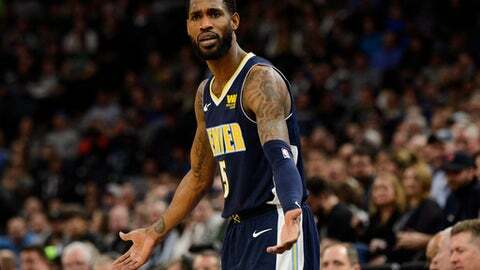 Will Barton is getting a major raise from the Denver Nuggets. A person familiar with the situation tells The Associated Press that Barton will sign a four-year deal that – if played to conclusion – would be worth more than $50 million. The final season will be at Barton’s option, according to the person who spoke on condition of anonymity because neither Barton nor the Nuggets were commenting publicly. Barton made about $3.5 million this past season, when he averaged career highs of 15.7 points and 4.1 assists. Barton’s deal is part of what’s shaping up as a major offseason for Denver, which is expected to offer Nikola Jokic a max deal that would pay around $147 million for five seasons. Jokic averaged 18.5 points and 10.7 rebounds last season. Wayne Ellington is entering free agency hoping for a speedy resolution. And although he expects calls from many teams, he’s still seeking a return to the Miami Heat. Ellington set a Heat record with 227 3-pointers last season, even though he was playing mostly as a reserve. He’ll be due a raise from his $6 million salary from a year ago, and that could be a challenge for Miami, which is trying to avoid paying a luxury tax. Ellington averaged a career-high 11.2 points last season. Former Cleveland Cavaliers general manager David Griffin says the NBA’s salary cap and luxury-tax figures aren’t to be overlooked as free agency opens. The league released its cap and tax numbers Saturday night for the coming season, and they’re slightly higher than some teams may have expected. Plus, cap numbers for 2019-20 and beyond are also a bit more than what’s been projected. ”It’s a really significant amount of money,” Griffin said, in his role as an analyst on NBA TV. A person familiar with the situation says that Kevin Durant will sign a two-year contract to remain with the Golden State Warriors, with the caveat that the deal will have an option and allow him to return to free agency next summer. The person spoke to The Associated Press on condition of anonymity Saturday because the deal cannot be signed until Friday. It is a win for the two-time defending NBA champion Warriors on several levels. Not only do they get to keep the 2017 and 2018 NBA Finals MVP, but they also get some financial flexibility in the deal. Durant will be paid $30.5 million this coming season, about $5 million less than he could have commanded if the deal was structured differently. That savings will give Golden State options for other moves this summer. The New York Times first reported Durant’s intention to sign the deal.